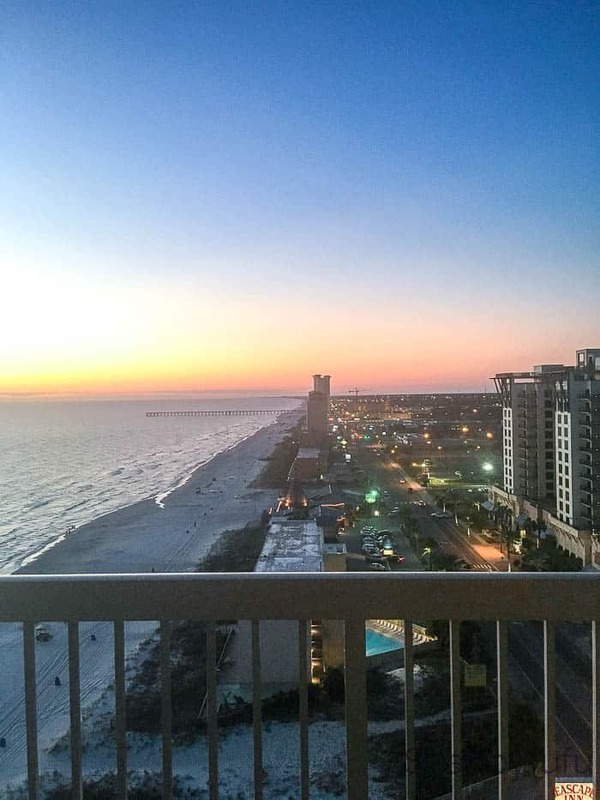 Today I’m stepping away from Miami to tell you about a fun trip that I just returned from last night to Panama City Beach, Florida. Although I’ve lived in Florida for most of my life I have never spent any time in the Panhandle region and I know that I’ll be back to explore some more! The beaches are the draw for tourism to Panama City Beach but I was surprised and impressed with all that there is to do in the area! This was the view from the 17th floor in the condo that I was provided with and the 3 bedroom roomy corner home in the sky became the hangout in our downtime for myself and a couple of blog friends who were on the trip as well. The beach is truly beautiful and the sand is soft and sugary white. Another perspective and if you look closely you’ll see a beach wedding by the gulf. A common mistake that I hear is the gulf side (west part) of Florida’s beaches as being on the ocean. It’s on the beautiful Gulf Of Mexico that is much calmer and the waters were turquoise without the big waves that we have on the ocean beaches. Whenever I’m in a city that is new to me I try to spend some time by myself to explore, and I walked the beach to this spot for lunch. 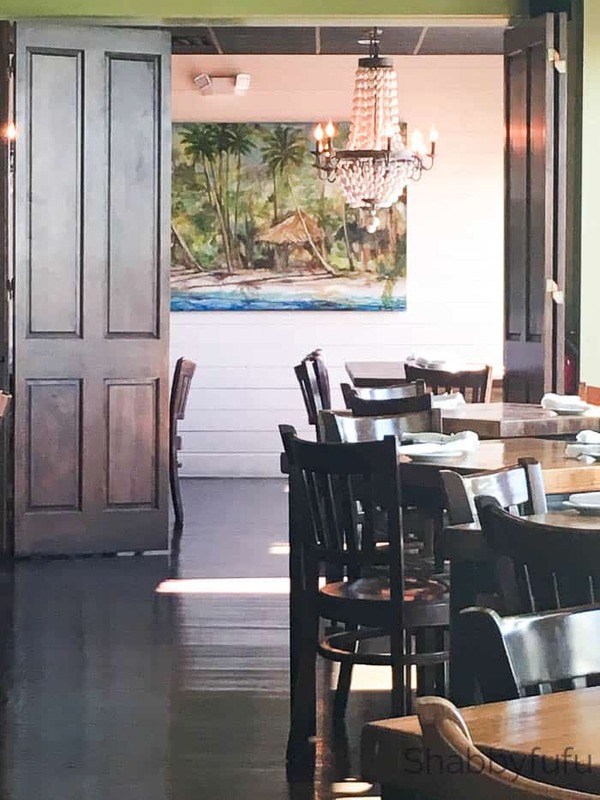 The food in Panama City Beach is very New Orleans inspired…but often with a great gulf view! I just learned about Chicory flavored coffee on this trip at one of our favorite breakfast places Andy’s Flour Power (not pictured) and now that I’m back went on-line and ordered some. I highly recommend that you stop at Andy’s for breakfast (and coffee) if you find yourself visiting PCB. Anyone who knows me is aware that breakfast is my favorite meal to eat out and what better than donuts across the street from the beach! 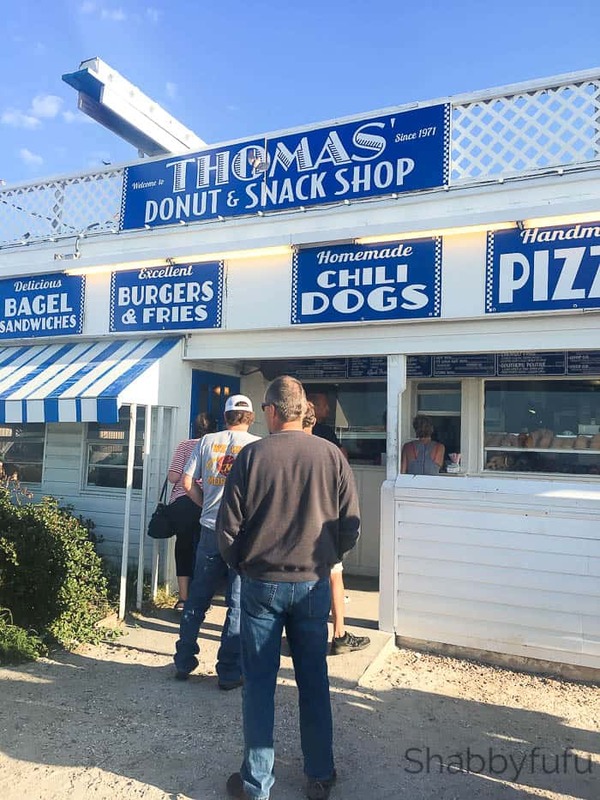 Thomas’ had the BEST donuts that I’ve tasted in a long time and they make them in-house. 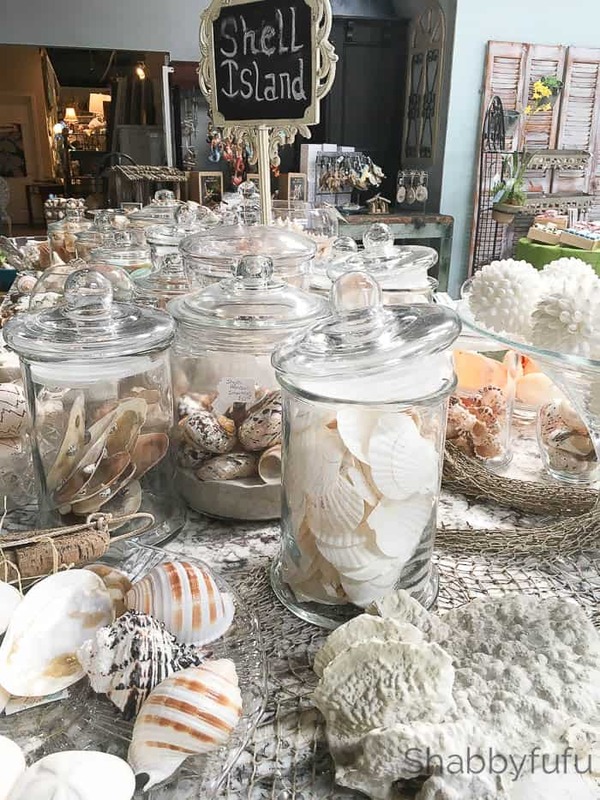 We had the chance to do lots of fun shopping while in Panama City Beach and the shops had all sorts of coastal decor, mixed with vintage, shabby chic and crafted by local artisan finds. 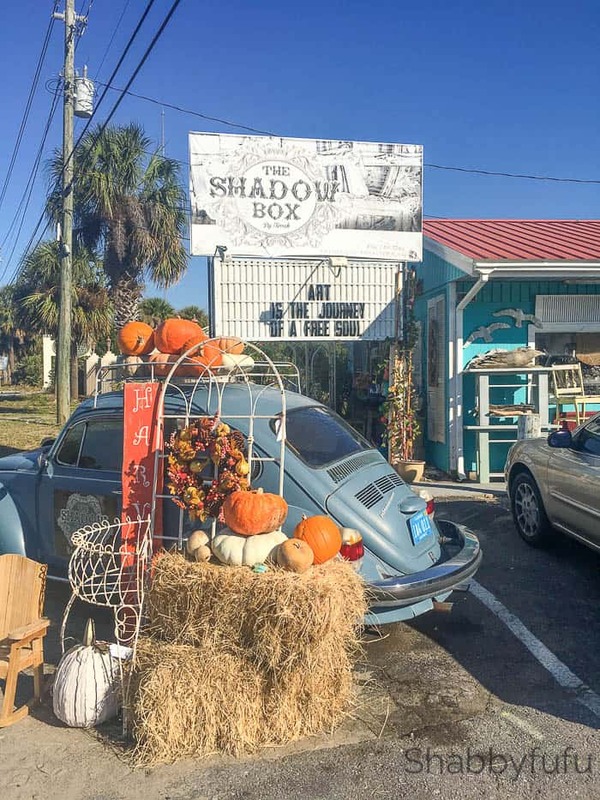 I loved the vintage Volkswagen Beetle display out in front of The Shadow Box! 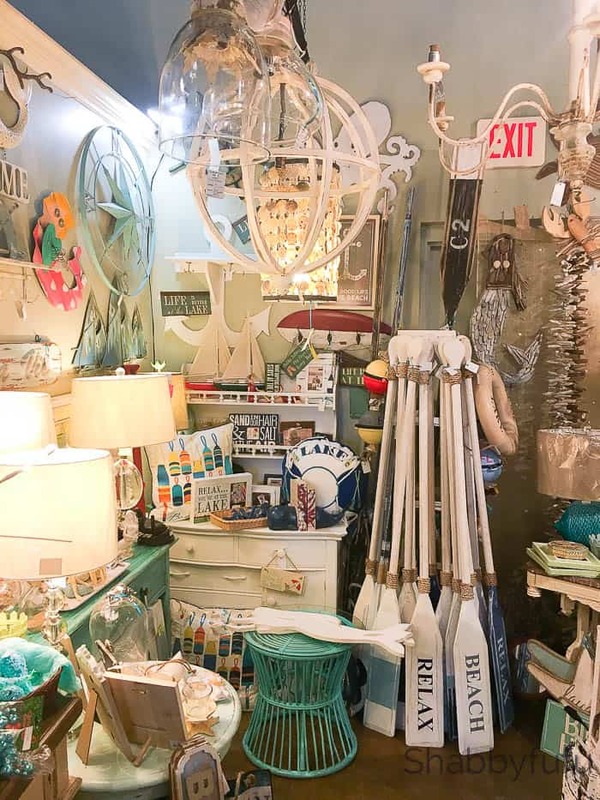 Pieces On The Beach was our next shopping stop and they are known as a one stop shop for coastal chic and antiques. 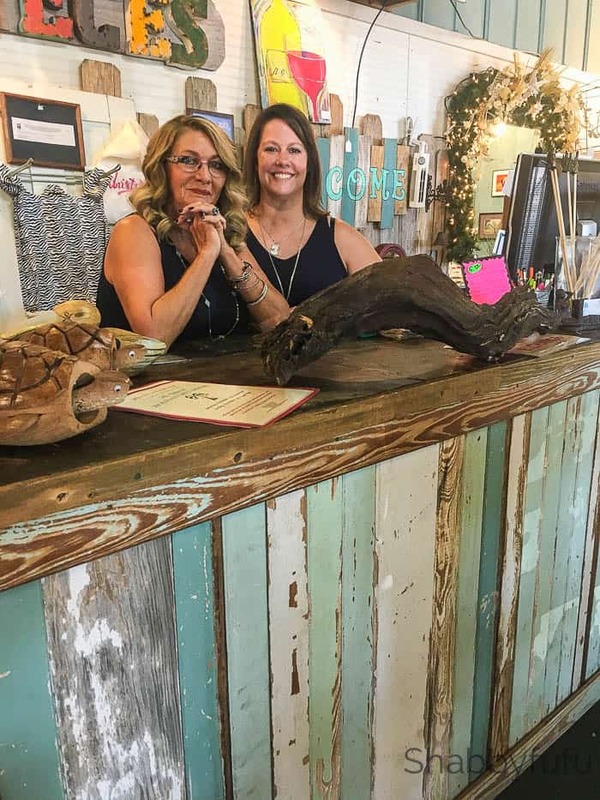 The checkout counter with the reclaimed wood is amazing! Here we are shopping and that’s me in the white blouse setting up the shot. I didn’t bring my camera, so all of these shots are from my iPhone 6S. 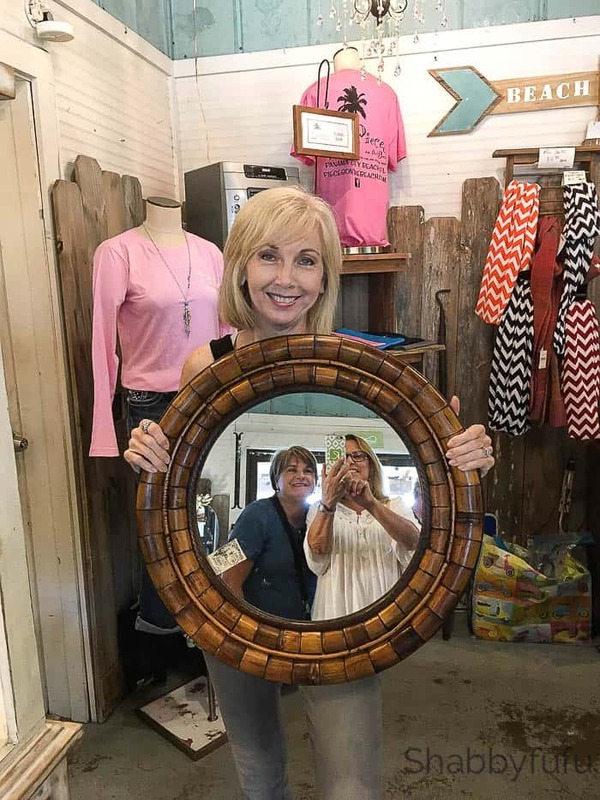 I’ll be listing all of the shops at the bottom of this post so that you can pop in on your next trip to Panama City Beach. If you are interested in seeing VIDEO footage, I shared some FACEBOOK LIVES in several of the shops that I’ll link below as well. Dinah’s Coastal Decor was one of my favorite PCB shops with lots of local artisan work available. 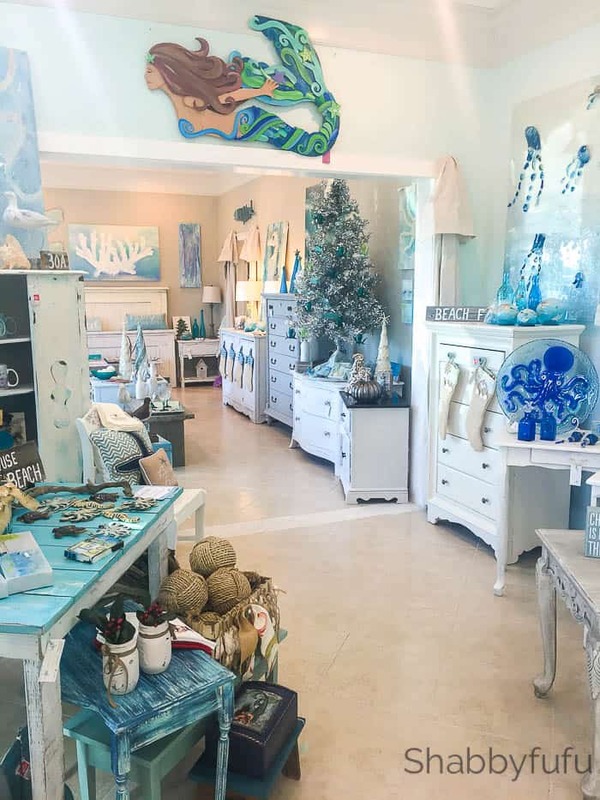 If you enjoy supporting local artists when you travel to Florida this shop is the one to see. This is really a great time to visit the area because it’s low season and uncrowded and yet the weather is pretty perfect! We had a temperature of 80 during the day with low humidity and in the 60’s at night. It was so pleasant that the Iron Man Triathlon was held on Saturday and gave us a bit of eye candy beyond the beach and shopping ;-)). Listed below are some of the shops that we went to and sources from Panama City Beach tourism for your convenience. Some of my store videos can be found on FACEBOOK under SHABBYFUFU. Just go to the VIDEOS tab. 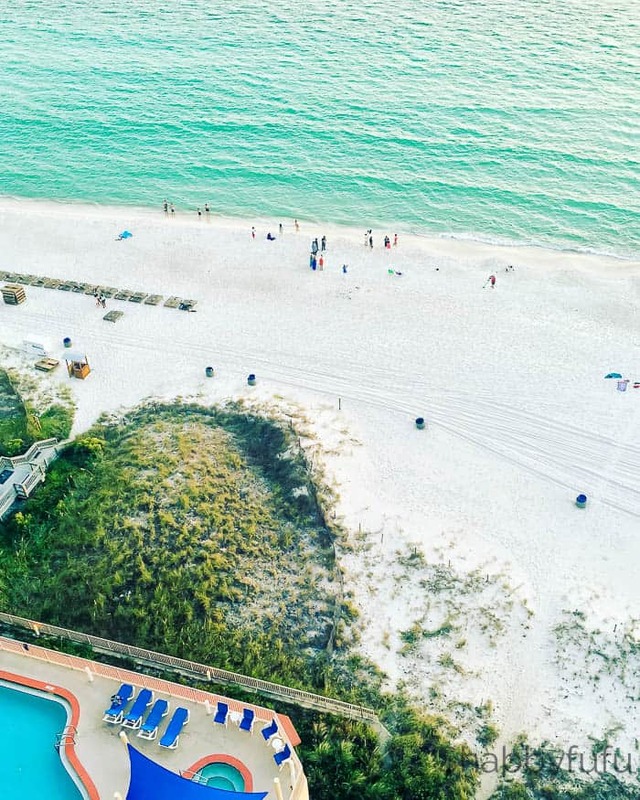 Thank you to Visit Panama City Beach for sponsoring this trip and please visit their WEBSITE to plan your next trip and full sources to the Real Fun Beach.